Looking for a residential snow blower that doesn’t skimp on power or features? Then a Briggs & Stratton two-stage snow blower may be right for you. With 7 models available, you can get heated grips, electric starters and remove chutes make them easy to use while their winter-specific engines and snow-cutting augers give you the power you need to clear out the deepest snow. All Briggs snow blowers are powered by their Snow Series engines. These are designed to start in temperatures as low as -20°F, whether you’re using a recoil or electric starter. The starter handles and controls on these engines are large enough to be operated while wearing gloves. The handles and control panel are designed so that one hand can engage the drive while the other hand is free to make adjustments to the chute and throttle. Snow is picked up by an auger with a notched edge that helps it bite into packed snow. A high-speed impeller gathers this snow and forces it out of the chute. For durability, power is transferred from the impeller to the auger using a transmission with an aluminum case, while the chute is made from steel. All models come with electric or crank-based remote chute controls. These snow blowers have a transmission with 5 or 6 forward speeds and 2 reverse speeds. The drive system connects to the wheels using a friction disc to save on weight and mechanical complexity. Briggs uses Arctic Trac tires to provide maximum grip on snow and ice. The Snow Series 900 in this model drives a 10-inch auger and 10-inch impeller. It can handle snow up to 20 inches high and has a maximum clearing width of 24 inches. The BL comes with dual halogen work lights mounted high up on the handle. It’s covered by a two-year residential warranty. These models aren’t just more powerful than the BL924R: they have dual trigger steering and come with heated hand grips. The Heavy Duty series is covered by a two-year residential warranty. This model comes with an 1150 snow series engine equipped with an electric starter. It has a clearing width of 27 inches, can tackle snow pack up to 20.8 inches high, and can throw that snow a maximum distance of 35 feet. The chute rotation and deflector control are electric. The skid shoes are reversible for longer wear. With a Snow Series 900, 24-inch wide auger and maximum 20-inch clearing height, it doesn’t have quite as much snow clearing power as the BM, but it can throw snow up to 40 feet, letting it work in larger spaces. LED work lights come standard, and it can be fitted with drift cutters and a snow cab. This model has the same features as the 1024MD, but it uses an 1150 engine, giving it more power to handle thick, heavy snow. Briggs’ top snowblower line comes with a warranty that covers 3 years of consumer use or 90 days of commercial use. All models come equipped with LED headlights and electric start, they can handle snow up to 20 inches tall, and they can throw snow up to 40 feet. Powered by a 950, this machine has a 24-inch auger width. This model uses an 1150 engine and has a 27-inch wide auger. 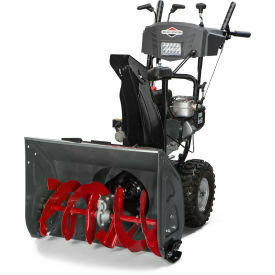 Briggs & Stratton’s most powerful snow blower comes with a Snow Series 1450 engine and an auger that’s 30 inches long. Shank’s Lawn Equipment sells and services a wide range of power equipment including Briggs & Stratton’s engines and power products. If you’re looking for a new snow blower, or you need your equipment serviced, visit our shop at 4900 Molly Pitcher Highway in Chambersburg, PA. To get here, take Exit 10 from I-81 and drive one mile East. Not in the area and need something for your B&S equipment? Visit www.shankslawn.com. We can ship parts and accessories for your snowblower to any address in the U.S. or Canada. This entry was posted in Uncategorized and tagged Briggs & Stratton snowblower parts, Briggs & Stratton Two-Stage Snowblowers, snowblower parts. Bookmark the permalink.